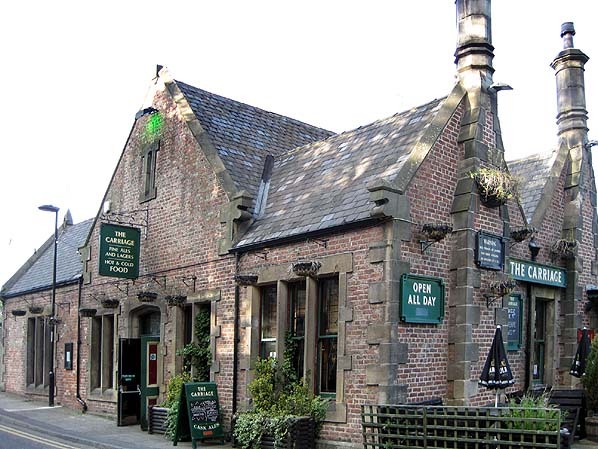 Present state: The station building is in use as a public house. Both platforms are extant. Note: Jesmond Metro station immediately north-west (opened 11.8.1980) replaced the ex-B&T station. the staff to maintain it and carefully tend the station garden. Their efforts were rewarded with certificates awarded in the North Eastern Region’s ‘Best Kept Station’ competition, proudly displayed in the booking hall. 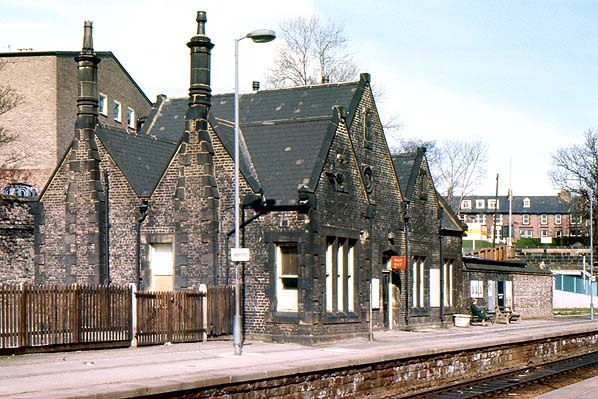 The buildings towards the north end of the down platform consisted of a lofty single-storey Tudor gothic booking hall built of brick with stone quoins. Fawcett (2003) notes the similarity of this design (also formerly at South Gosforth) to some of Brunel’s GWR stations, such as Culham. He describes the structure as a three-cell building, with the roof ridges all in line but stepping down to different heights either side of the central portion. The separate stationmaster’s house was added in 1879. Fawcett remarks that the NER tried to provide an inexpensive dwelling for under £300, but the discerning local residents insisted on something of a more ornamental character. The result was a building decorated with lavish bargeboards; regrettably it was demolished in the mid-1970s. company’s early diamond motif: in effect a spike above and below the centre of the board, and these were in place until about 1959 when BR(NE) vitreous enamel signs replaced them. The LNER also installed swan-neck electric lamps and nameplates, but BR did not fit totem signs. In 1971 tall ‘vandal-proof’ lamps replaced the LNER ones, and corporate identity signage followed in 1973. 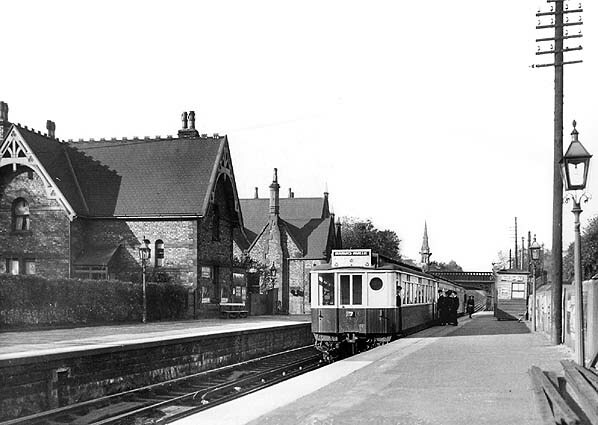 Inner suburban stations proved vulnerable to competition from road transport, and, apart from Backworth, Jesmond booked least passengers of any of the Coast Circle stations in the 1950s. The light use resulted in the withdrawal of winter Sunday services from 1964 until 1970. Total closure came in 1978 in connection with conversion of the Coast Circle line to Metro light rail. A single track is retained through the station for empty Metro stock movements. 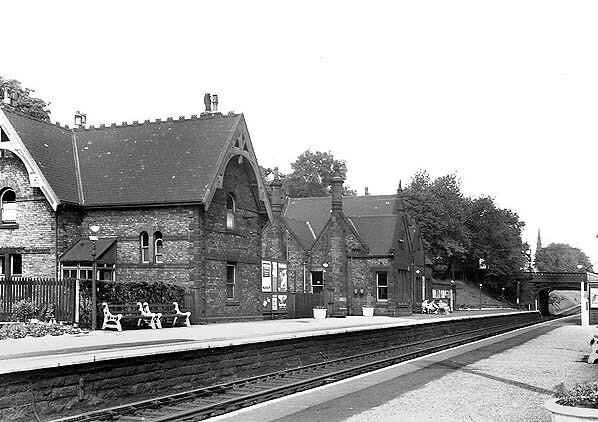 The platforms are intact and the station building is in use as The Carriage public house. On the same platform, a structure in the style of a signal box has been constructed which, together with an old Gresley brake carriage, are the premises of Valley Junction Indian Restaurant. the line (including the Riverside branch) and the South Shields branch. Although the Riverside continued to have a sparse service at rush hours only, the Coast Circle’s 20-minutely service returned, with the new feature of trains in the early hours to bring revellers home from Newcastle city centre. Passenger numbers increased dramatically, and strengthened the case for further investment. The idea of incorporating the local railways into a rapid transit system was examined, and in 1973 Royal Assent was obtained to use the Coast Circle as the basis of such a network, which was to become the Tyne & Wear Metro. Tickets from Michael Stewart except 8219 CJ Dean and goods labels from Brian Johnson. 1906 Bradshaw from Chris Hind, 1864, B & T timetable from C J Dean. Street map from Ali Ford. Route map drawn by Alan Young. To see other stations on the Blyth & Tyne Railway Newcastle - Backworth line click on the station name: Newcastle New Bridge Street, Manors North, West Jesmond*, Moor Edge, South Gosforth*, Longbenton*, Benton (1st site)*, Benton (2nd site)*, Forest Hall, Benton Square and Backworth (2nd site). Early electric stock at the up platform at Jesmond bound for Manors North (on destination blind) c.1910. 1896 1:500 OS Town Plan. On the west (down) platform the station building (to the north) and stationmaster’s house (to the south) are shown in considerable detail. The building accommodating the waiting room and ticket office on the up platform is not shown. 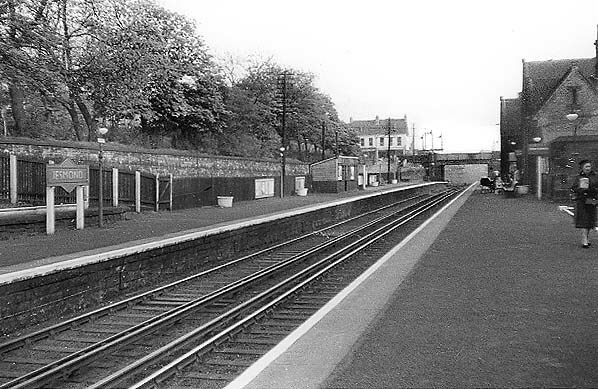 The down (west) platform, looking north-west from the up platform in 1951. Points of interest are the typical LNER platform lighting and nameplates and the fire buckets hanging from hooks on the station building. The two concrete seats with wooden slats look out-of-keeping in this timeless setting. Looking south from down platform in 1959. Note the unusual LNER running-in board on the opposite platform: probably unique to Coast Circle stations. 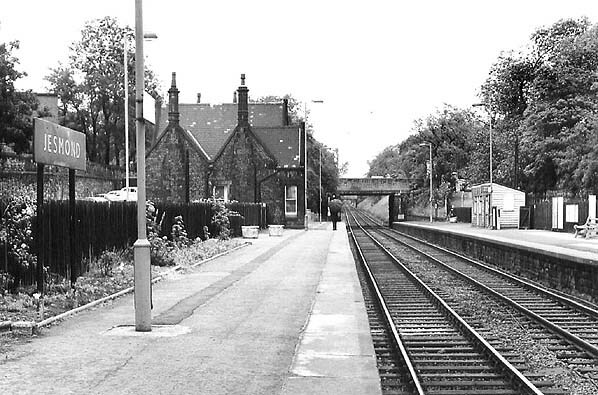 General view, looking north from the up platform in September 1963. The stationmaster’s house, with its fine bargeboards and the gothic station building are shown clearly. The northbound EMU is leaving the near-level track through Jesmond and is about to tackle the 1 in 75 gradient up to West Jesmond. A hundred years after it opened, and only a mile from the centre of Newcastle, the station retains a quaint, rural character. General view, looking north-west across the up platform in April 1973. The stationmaster’s house is still in place but would soon be demolished. At this stage the modern lighting had been installed, and the former standards carrying the station nameplates had been removed. For two years the only name signage was on the BR(NE) running-in boards, one of which is seen here. This view north from the down platform was probably taken in 1973 after the modern lighting and corporate identity signage was fitted, but before the BR(NE) running-in nameboard was removed. 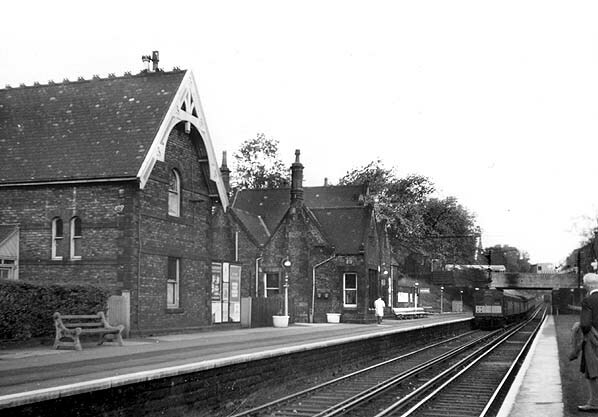 The stationmaster’s house had recently been demolished, but the station building on this platform and the timber waiting shed opposite it survived until the station was closed in 1978. 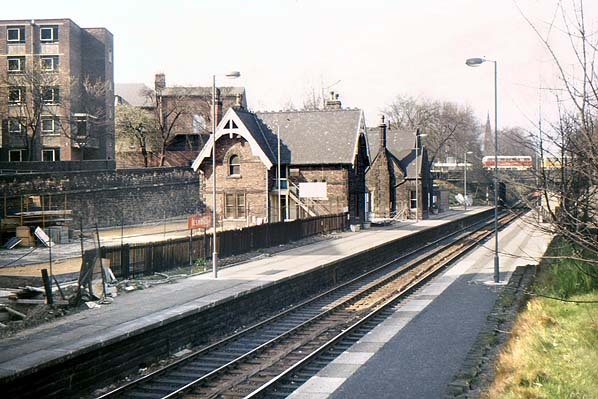 The main building, looking north-west from the up platform in April 1977. The bricks were blackened by atmospheric pollution, giving the appearance of neglect. 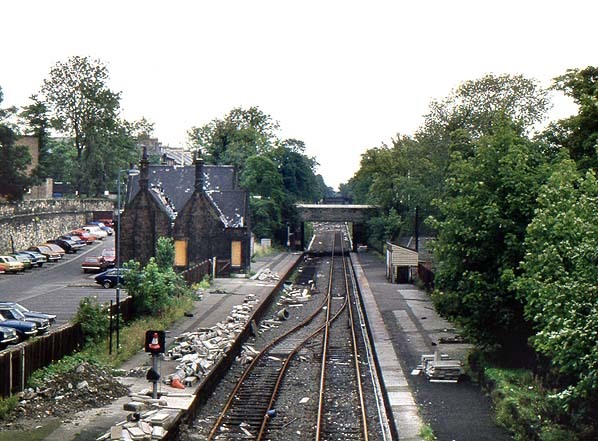 Looking north from Sandyford Road in August 1979 seven months after closure. Jesmond station has been transformed from dereliction with enterprise and good taste. In the foreground, on the former down platform, a new building mimics the design of a North Eastern Railway signal box, and beyond it is an old Gresley brake coach; both belong to the ‘Valley Junction’ restaurant. In the background the station building has been refurbished as the ‘Carriage’ public house. The station continues to be of service seen here in August 1998. 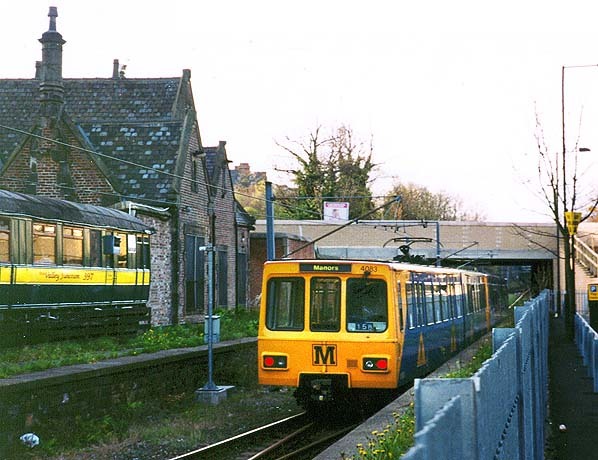 Looking north from the up platform in 2004, a Metro multiple unit is seen using the 'empty stock' line through the former Jesmond station. 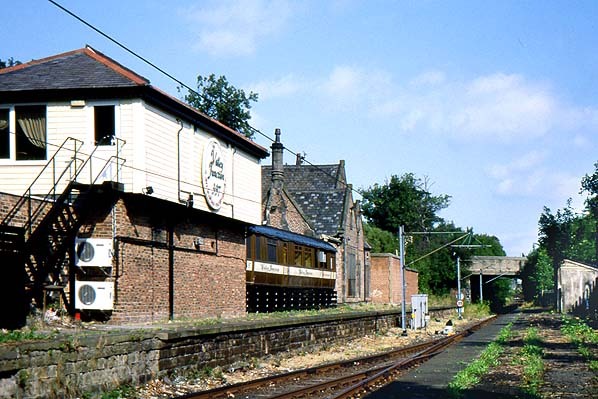 The former station building and the coach in the background are now used as a pub and restaurant. area now used as a car park. 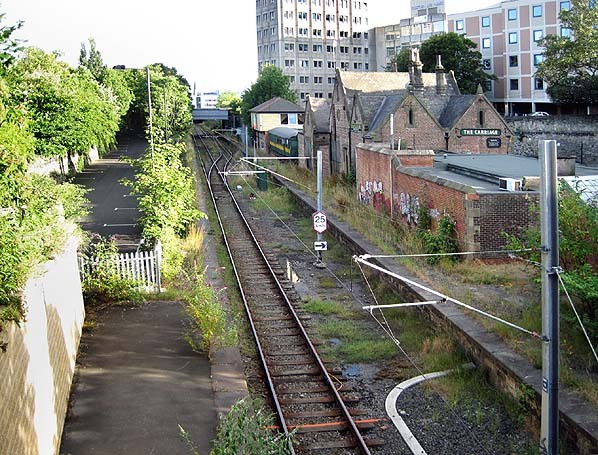 10 Jesmond station building, looking north-east in July 2010. The Gothic-influenced structure is constructed of brick with sandstone used for quoins, window dressings, the raised gable and kneelers. The double pitched roof and hexagonal chimney stacks are features of note.